Thomas Jefferson was an accomplished violinist, and making music was a favored activity of his family and their many guests. 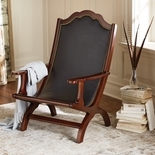 This elegant mahogany stand replicates the late 18th-century original seen in Monticello�s Parlor. The three-position music rest is attached to a height-adjustable pole that slides within a neatly turned pedestal shaft. 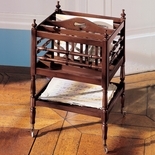 39 1/2"-52 1/2" h x 19"w x 14 3/8"d.
Jefferson devoted his musical talents to the violin�the king of instruments in his time�and practiced for three hours a day from 1764 to 1776. Although he never played professionally, he did perform for a time with Francis Fauquier, the governor of Virginia in the 1760�s.